Portuguese navigator Ferdinand Magellan sailed from SanlÃºcar de Barrameda on September 20, 1519, with five vessels and about 265 men. Sighting the South American coast near Pernambuco, he searched for a suspected passage to the South Sea and ultimately found the Strait of Magellan. On March 6, 1521, Magellan reached the Marianas and 10 days later the Philippines, where he was killed in a battle with the natives. 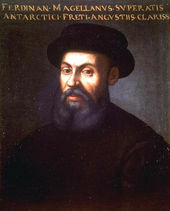 How many of Magellan's original crewmembers returned to Spain alive? The boomerang is a sickle-shaped throwing stick used mainly by the Aborigines of Australia. Its arms are slightly curved, and when it is thrown, the boomerang generally follows an arc-shaped trajectory. Recreational boomerangs often travel along a circular path and return to the thrower, but other, larger versions do not return and are used in hunting and warfare. The oldest known boomerang is believed to be 20,000 years old and was discovered in what major European mountain range? Mengele was an SS officer and physician in the Nazi concentration camp Auschwitz. He supervised the selection of arriving transports of prisoners, determining who would be killed immediately and who would become a forced laborer. He also selected inmates to be test subjects in horrific experiments, during which they were frequently subjected to sterilization surgeries, limb amputations, injections into the eyes, and other brutal procedures. What became of Mengele after the war?